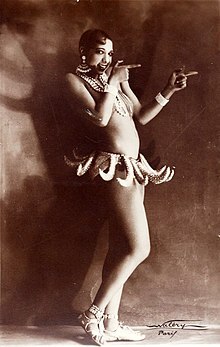 Josephine Baker (June 3, 1906 – April 12, 1975) je onijo, akorin ati osere omo Amerika ara Fransi to je mimo kaakiri bi "Black Pearl," "Bronze Venus" ati "Creole Goddess". Oruko abiso re ni Freda Josephine McDonald ni St. Louis, Missouri, Josephine di ara Fransi ni 1937. O gbo ede Geesi ati ede Fransi daada. Baker ni omobinrin Afrika Amerika akoko to di osere pataki ninu filmu kan, Zouzou (1934) tabi to gbajumo kari aye gegebi onifaaji. Baker ko lati sere fun agbo eleyameya ni Amerika, be sini o tun kopa ninu Iwode awon Eto Araalu. Coretta Scott King fun ni ipo olori iwode yi ni odun 1968, leyin ifikupa Martin Luther King, Jr.. Baker, however, turned down the offer. She was also known for assisting the French Resistance during World War II, and received the French military honor, the Croix de guerre and was made a Chevalier of the Légion d'honneur by General Charles de Gaulle. Josephine Baker was born Freda Josephine McDonald in St. Louis, Missouri, the daughter of Carrie McDonald. Her estate identifies vaudeville drummer Eddie Carson as her natural father; Carson abandoned Baker and her mother. Carrie and Eddie had a song-and-dance act, playing wherever they could get work, and when Josephine was about a year old they began to carry her onstage occasionally during their finale. Josephine was always poorly dressed and hungry, and her playground became the yards of Union Station. From this she developed her street smarts. When Baker was eight she began working as a live-in domestic for white families in St. Louis. She was sent to work for a woman who abused her, burning Baker's hands when she put too much soap in the laundry. ↑ 1.0 1.1 "Josephine Baker (Freda McDonald) Native of St. Louis, Missouri". Retrieved 2009-03-06. ↑ 2.0 2.1 "A – About Art Deco – Josephine Baker". Victoria and Albert Museum. Retrieved 2009-03-06. ↑ Roberts, Kimberly (8 April 2011). "Remembering Josephine Baker". Philadelphia Tribune. ↑ "About Josephine Baker: Biography". Official site of Josephine Baker. The Josephine Baker Estate. 2008. Retrieved 2009-01-12. ↑ Wood, Ian (2000). The Josephine Baker Story. United Kingdom: MPG Books. pp. 241–318. ISBN 1-86074-286-6. ↑ . Whitaker, Matthew C. (2011). Icons of Black America: Breaking Barriers and Crossing Boundaries. p. 64. ↑ "The Rise and Fall of Josephine Baker". Dollars & Sense 13. 1987. Àtunṣe ojúewé yi gbẹ̀yìn wáyé ni ọjọ́ 12 Oṣù Keje 2014, ni ago 06:54.